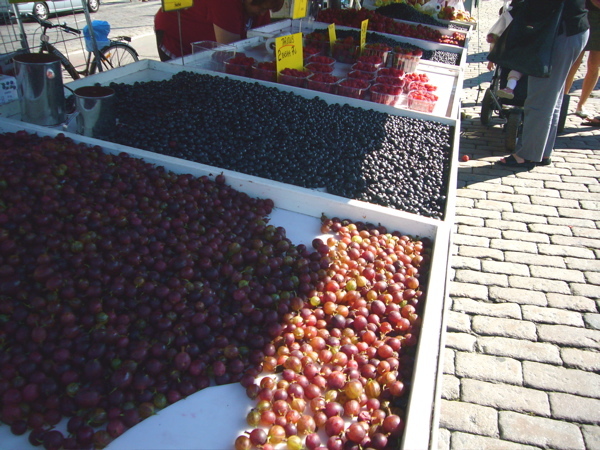 Finnish strawberries, Finnish blueberries, you name it berries, they are all good, better than anywhere else…as is with most things in Finland, they are concentrated! Full of flavor! Eat them fresh from the market or dried, YUM! In a powdered form or in soup, better yet, they are CHEAP a whole 2 pints of red currents for $3, finally something affordable in Finland! Whohooo! Please note the metal cup in the photo used for measuring out a liter or a half liter, I was surprised to see such a system in place here rather than selling by weight. We are working hard on getting some of these handmade cups for KIOSK, they have the Finnish authorities official mark on them and are lovely. The elderly gentleman who makes them does not speak English so this is a SLOW process. Is Finland our shopping destination in September? Can’t wait to see what you find for us! Lovely! Can’t wait to see what you bring back.